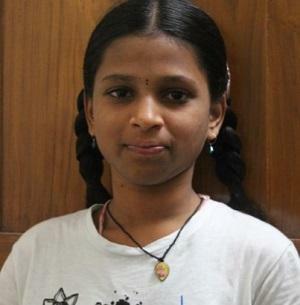 U Rashita (STD VII) is from ECIL, Hyderabad and studies at Sri Sai Model High School, Cherlapally. Her sister is also at Sphoorti Foundation. Their father Srinivas is an auto driver. Mother Sharada passed away due to dengue fever in 2012. When it became difficult for his father to look after his two daughters, he contacted Sphoorti Foundation.